In January, Avant Tecno exhibited at World of Concrete in Las Vegas, USA. 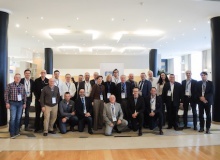 In February the European Water Jetting Institute (EWJI) hosted the European Water Jetting Forum 2019 in Brussels with some 20 participants from national associations, contractors and manufacturers in attendance. On 15 February, the German Demolition Association (GDA) held its 25th annual demolition conference with a truly celebratory occasion. 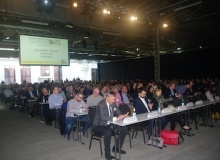 This year’s event was held at the Station-Berlin, an old former mail railway station and now an industrial monument located in the heart of the city, making it the ideal location for a demolition industry event. The 10,000th E10 1t mini excavator rolled off the Bobcat production line in 2018 in its 10th year of production. 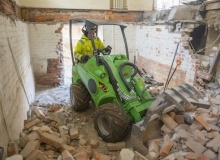 The E10, now renamed the E10z, has proved to be ideal for a variety of applications including rental, construction, demolition, refurbishment, landscaping, trenching and drainage work. The cesspit in Nesselbach is no longer needed, and displaying high levels of power and speed, the Rockwheel D15 has ground through its 200m concrete walls. Only the untouched back wall and the ground material the size of pebbles was left, with the latter material being then used on site to form the foundations of a new development. ‘Necessity is the mother of invention’ they say, and often they are right. This age old adage is a perfect illustration of the story of Spanish based Xcentric Ripper, whose eponymous flagship product was indeed born out of dire necessity. When the 2008 banking meltdown paralysed the global construction industry, the Spanish market (by that time already in recession) just spiralled downwards. But thanks to the resourcefulness and resilience of Xcentric Ripper’s indomitable founder Javier Aracama, the company eventually managed to turn adversity into a triumph. Andrei Bushmarin reports. A Kemroc EK 150_800 chain cutter mounted on a 50t excavator was used to renovate and extend a ski area in Styria, Austria. 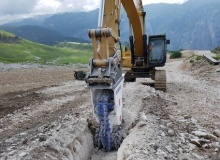 The work required a 700m trench to be excavated in hard limestone at an altitude of 1,700m to supply water to new snow cannons. Thanks to the productivity and low transport costs for excavated and fill material resulting from the use of a grinding attachment, the contracting company, Karl Pitzer GmbH, succeeded in completing this ambitious project in time and within budget. 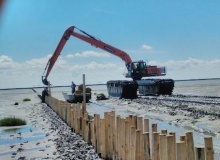 A new 22t Doosan DX225LC-5 crawler excavator has been converted into an ‘all-terrain’ machine for contracts being carried out in the Wadden Sea, by German company, Sven Jacobs Tief-Garten-und Landschaftsbau. 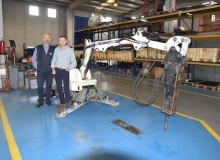 The conversion of the excavator, supplied by local Doosan dealer, Atlas Hamburg GmbH, was completed by Olko-Maschinentechnik GmbH from Olfen (NRW). Volvo Construction Equipment has during the last four years made a radical change to the offering from its demolition machinery segment. 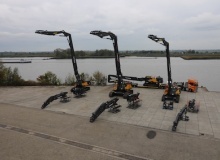 It began in 2014 when its E-series high reach excavator models were launched beginning with the EC380EHR and EC480EHR. Now this autumn the manufacturer has launched its latest flagship development, the multi-purpose EC750E HR demolition excavator. Jan Hermansson reports. 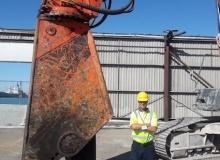 Despite depressed business conditions in the South African demolition industry, local company Wreckers Dismantling has successfully ended the year with two challenging explosive demolitions in difficult locations. 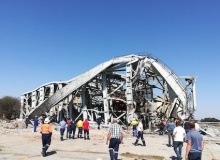 The robotic demolition market is, for the want of a better word, a tightknit one. Once dominated by Brokk which pioneered the technology, today it is seeing the rise of more and more new players. Following in the footsteps of Husqvarna, Toptec and Avant Tecno, a new wave of manufacturers is joining Brokk’s competition. Among these is Catalonia based Euro Implementos, which may be considered challenger ‘numero uno’. Andrei Bushmarin reports on his visit to the Spanish manufacturer. Finland based Delete is one of Europe’s brightest demolition stars. A young company by the industry’s standards (Delete was established in 2010), it has been developing by leaps and bounds during the current decade. Now the Delete Group incorporates 40+ companies focusing on demolition, recycling and industrial cleaning. 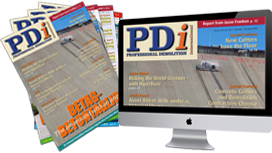 The contractor, which operates throughout Scandinavia, invited PDi to one of its ongoing projects in Finland. Andrei Bushmarin reports. Businesses by nature strive for continued growth. When a company ceases growing, it takes a first big step towards its own undoing. However, explosive uncontrolled growth can lead to the same bitter result. 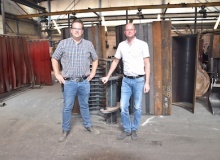 Aware of this fact, Netherlands based attachment specialist Pladdet is expanding its business in a rapid yet highly controlled manner. Andrei Bushmarin reports. In September, Hitachi Construction Machinery Europe (HCME) inaugurated its redesigned demonstration area at its headquarters in Amsterdam, the Netherlands. This has been redesigned in order to showcase a wider variety of machines in a more attractive and technologically advanced environment. 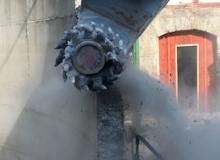 Fortress attachments are designed and manufactured by ShearCore, which is located in Superior, Wisconsin, USA. On 15 September, the supplier of excavator attachments for demolition, recycling and agriculture professionals, Hydraram, celebrated its 25th anniversary by throwing a gala party at its headquarters in Surhuisterveen in northern Holland. Apart from some 250 visitors from all over the world, including family and friends, the party featured full size dinosaurs and a crew of super heroes as very special guests. Andrei Bushmarin reports. 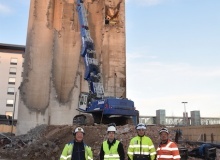 Demolition of the Düte Bridge was made more difficult for demolition specialists, UPEK GmbH, due to the very unusual method used to construct the bridge. 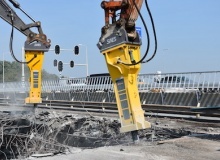 Dutch contractor LEK Sloopwerken recently demolished three 150m long viaducts on the A27 motorway in the Netherlands during a single weekend in May. 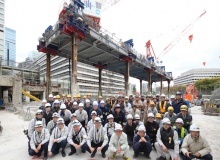 Japanese contractor, Taisei Corp., has introduced a safe and environmentally friendly demolition system that is considered by many as a turning point in the industry. The ‘Taisei Ecological Reproduction System’, or more simply known as the ‘Tecorep’ system, is ideal for locations where conventional demolition methods cannot be used such as ultra-high rise buildings. PDi Asia Editor Shinichiro Nakaba reports.